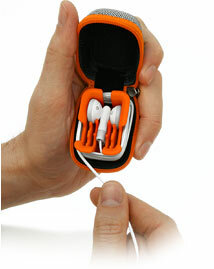 SendStation is pleased to introduce earBuddy, the ultimate carrying case and the only safe place to store your iPod earbuds. Coated with sturdy ballistic nylon, this tiny, ultracompact case  it’s only the size of a jewelry box  can stand up to the everyday dangers of the urban jungle and those in the boondocks, too. The well-designed ABS reel inside the case lets you easily wind up the cable and store everything in the smallest possible space. earBuddy is built to withstand 200 lbs. (90 kg) of force, keeping your buds safe and sound on the inside even if someone  or something  is pounding on the outside. earBuddy is available now from our online store and from selected dealers worldwide for only $12.95. "The best-looking earbud protector we’ve seen... highly impressed by the build quality and feel of the design... "
"...combines good looks, durability, and a small size." Got a question or need technical support on this product? Visit our FAQ & Support section. Share this site with a colleague or friend who’d be interested in the earBuddy.